In 2001 Lindsey Hilsum pronounced the Israeli left dead. In 2009 the media reported 90% support among Israelis for Operation Cast Lead, which led to the deaths of 1,400 Palestinians in Gaza, the vast majority of whom were civilians. As the latest attack on Gaza proceeds unabated, this report asks “What is the state of the Israeli Left?” in 2011. But first, why is it even relevant, or necessary, to examine the role of the Israeli Left? It is very simple: Israel is in full control of the borders, airspace, water and movement of the people who inhabit the Gaza Strip and the West Bank (Hamas and Fateh being merely administrative bodies in these two areas). The Palestinians in the Occupied Territories have no citizenship, and their human rights are regularly violated by the occupying power. Given that the Israeli Left is constituted of citizens of the Jewish “democracy” in charge of the Occupation it is only logical to conclude that they have more leverage than the Palestinian people vis-a-vis the Israeli government. Historically, the Israeli Left has never been outside of the Zionist consensus. In fact, many like to reminisce about the early days of Jewish settlements in Palestine-Israel, supposedly characterized by the socialist utopias of the Kibbutz and Moshav. This vision of good, little Israel, marred by the Occupation of the West Bank and Gaza since 1967, likes to leave out the fact that Israel was established on the land of over 750,000 Palestinians, expelled during the 1948 war, and that the remaining 200,000 Palestinians, though bestowed with Israeli citizenship, were kept under martial law until 1966, in conditions not too dissimilar to the contemporary West Bank. The Israeli Peace Now movement which emerged in the 1980s, called for an end to the Occupation and a withdrawal to the 1967 borders, as well as the dismantling of the illegal settlements. With the signing of the Oslo Accords in 1993-5 many proclaimed the victory of the peace camp, and then pronounced its subsequent demise with the outbreak of the second Intifada in 2000. However, few like to look back on the period between 1995 and 2001. A period during which Israel’s illegal colonial settlements in the West Bank and Gaza doubled in size from the time of Oslo; or the fact that the agreement had left the Palestinians in charge of less than 15% of the Occupied Territories, making the prospect of a viable Palestinian State in the West Bank and Gaza highly unlikely. Since 2001, a succession of prominent former Peace Now activists have declared their opposition to the Palestinian right of return, effectively signalling their unwillingness to acknowledge one of the most important issues for the Palestinian people. Since then a procession of ultra-right-wing, pro-settlement governments have been elected to the Knesset (Israeli Parliament). In July of this year a ‘Solidarity March’ in support of the Palestinian Authority amassed 4000 people. The Israeli turnout in support of a two-state solution based on the 1967 borders doesn’t bode well for peace when both Israel and the US have declared that they will veto a UN acceptance of a Palestinian state in 2011. Nor does the passing in July 2011 of the anti-Boycott law give any reason for hope. Israel sees the West Bank, in particular, as ‘disputed’ rather than ‘occupied’ territory and the a Israeli law that makes it illegal to call for the boycott of Israel, or the settlements, effectively declares these settlements, which are illegally built in the Palestinian Occupied Territories, part of the Israeli state itself. The UN vote on Palestinian statehood will either surprise the hopeless or will sound the final death knell for a two-state solution. In the later scenario, we will have to start talking about the onset of official Israeli Apartheid. 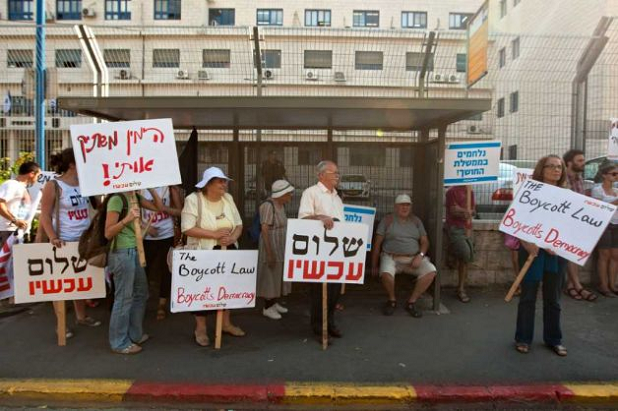 Most of the remaining Israeli Leftists support a boycott and have vowed to fight the anti-boycott law in the High Court. However, the Israeli Left is increasingly embattled and more marginalized than ever. Perhaps more telling is the fact that the largest popular movement since Peace Now—the 2011 Israeli Real estate protests–refused to take a stance on the conflict. In fact many fear that the protests would be hijacked by the settler movement promising to alleviate the perceived housing crisis in Israel by building more settlements in East Jerusalem and the West Bank. This suspicion has proven to be well-founded following the televised appearance, in mid September 2011, of the leaders of the real estate movement, J14, at Ariel, the largest settlement in the West Bank. The above can be juxtaposed to the horrific, and largely unreported, attack on Israeli solidarity activists by settlers from Ananot, a settlement built on the land of Anata, East Jerusalem. The unprovoked attack, which has been described by those present as a “lynching” and “pogrom”, took place less than two weeks ago, on Friday 30th September 2011. The peaceful Israeli activists were set upon by a mob of Ananot settlers during their solidarity visit with Palestinian farmers who have been subjected to longterm harassment by the same settlers. A youtube video shot on the night of the attack shows the settler crowd chanting “Death to the Arabs” and “Death to Leftists” as they kick, punch, and terrorize the activists, while Israeli security fail to intervene. For most Palestinians, “pogroms” akin the one carried out on Friday, 30th Sept, are a regular occurrence; with growing reports about a rise in settler violence in the West Bank coinciding with the PA bid for statehood. Last week’s attack against Israeli activists highlights the fact that the settler movement no longer feels the need to hide beneath a transparent cloak of democratic jargon. It is increasingly clear that they feel secure enough to act with impunity against non-citizens, whether those be occupied Palestinians, or, it now seems, leftwing Israelis as well. Such news is likely to lead to despair, but only if one expects change from within Israel. If developments such as the anti-boycott law are an indication of what is working and hence which strategies need to be pursued more vigorously, the solution is pretty clear. Whether a Palestinian State is voted in at the UN in the next few months or the two-state option is buried for good, Boycott, Divestment and Sanctions remains the most effective tool for those outside of Israel-Palestine to challenge settler-colonial impunity and restore some sense of justice for the Palestinian people and their supporters. Being one, is something that, unfortunately, was denounced from the consensus long ago. I see it this way; we’ll stop calling for BDS when Israel stop the occupation. The other link with your so-called Real estate protests is the price of food. If the international community ceased the boycott in some bizarre turn of events, Israelis would find food cheaper as Tenuva and others grip of the market is weakened.